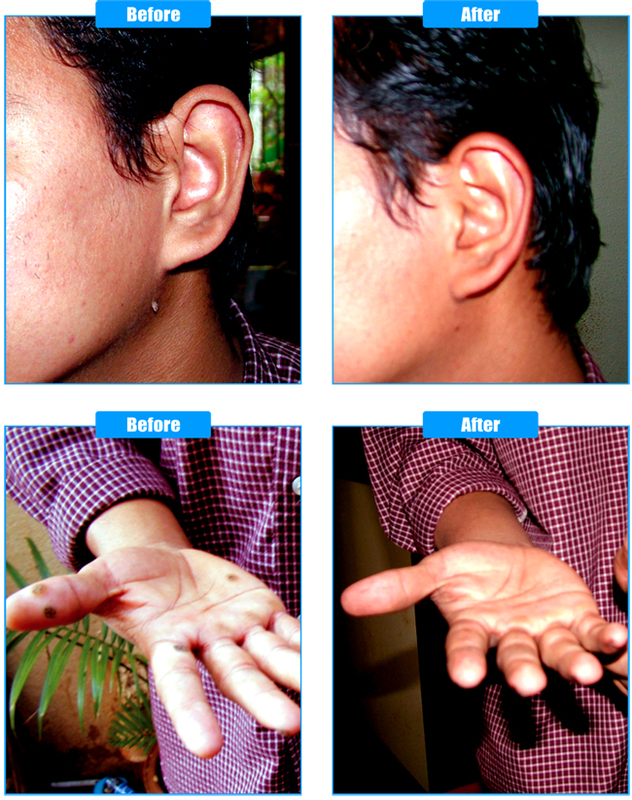 Warts is a very common ailment which can be treated successfully with dynamism without surgery. Here Dr.K.Savitha compiles and presents a case of warts treated successfully at AKP Homoeopathic Clinical Research Center.She can be contacted at AKP Homoeopathic Clinical Research Centre, 6 Lloyd's II Lane, Royapettah, Chennai -600014. A male aged 24 years presented with warty growths in the left side of the face just below the left ear and palms since one year. The lesions initially started from the index finger, later emerged to other areas. The lesions were hard; ash coloured with zigzagg margins in some indurations. Initially he tried Causticum advised by a internee nearby his home. His family physician advised for cauterization, but he was reluctant to it. · Had vaccinations for all communicable disease in child hood. · H/o fever with cold occasionally. · Had chicken pox when 7 years old. · H/o Tinea versicolor over trunk three years back. · Has the habit of taking tea. Mental, intellectual state of mind is very calm; Mingles easily with others. Warts in the thumb disappeared. Followed with placebo for a month and stopped. Thuja was prescribed here on understanding the miasmatic block, which was not responded to the pathological prescription of Causticum. The sycotic tendencies in the past and present lead to the prescription of Thuja and also gives confidence in selection by understanding the remedy as king of anti sycotic remedy.